Physical appearance: Despite how skinny he is, Amaya stands just at 5'1, and weighs 43 kilograms. He describes his hair as unruly and plain black, but others (usually more poetic people) describe his hair as dark blue, like the depths of an ocean, and as free as a river emptying out into an ocean. His eyes are the color of a sky before a storm, and he wears plain clothing, which is entirely black or dark grey. People want to call him "Goth", but can't bring themselves too. 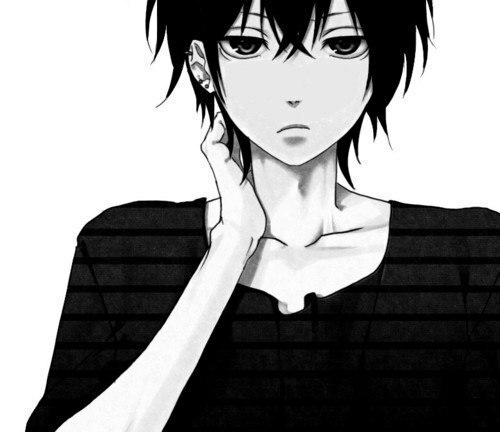 Amaya has a silver ring pierced into his ear, and a round "girly" face, which seems to never grow facial hair. While it is not clear, he does have some muscle, though he retains his skinny stature. Personality: Despite his apathetic tone of voice, Amaya is an interesting guy. He describes himself as a "calm lunatic," with his definition of lunacy being someone who acts crazy or stupid on purpose. People say his eyes hide a "whole world", saying that there is great happiness, even grater sadness, and the greatest will that you will ever see in his eyes. It is clear that he is wise beyond his years, but pretends to act stupid (in a calm way), so that people don't think of him a certain way. He almost never loses his temper, and is ready to risk his life in case someone is in danger. Amaya has no discrimination against anyone, which is one of the reasons to his pansexuality. He has no tolerance of bullying, and Amaya admires heroic people. Amaya appreciates hard work. Background: Ever since he was a child, Amaya wanted to be a Hero. However, his Quirk never manifested. Worried, his parents took him to a Doctor, where they determined that Amaya would never develop an "Individuality". This caused his to become distant from everyone, even his own parents. His mother described the experience as so: "He cried for a whole week, just non-stop. He would barely eat, barely even come out of his room. Then it just...stopped. He was done crying, but his face had no emotion. It was like he cried out everything that made him Amaya". This alludes to the fact that Amaya used to be incredibly cheerful. Even though he would never have a Quirk, Amaya still dreamt of being a Hero. While he had no friends, he would help anyone who needed it, going from buying someone lunch to taking a beating for someone. Sometime during middle school, there was a large fire that a bunch of Heroes couldn't put out, due to none of the present ones having an Individuality that was useful; all the Heroes that did wouldn't be able to make it in time. In the building was a family who was calling for help, and no one would go in. Amaya wanted to run away. Instead he ran towards the building. Almost dying, he was able to rescue the family, before collapsing inside the building. This caught the attention of retired Hero Silvertron. Amaya begins training under Silvertron, ever since he revealed something impossible: His power can be inherited! Strengths: No one knows why, but Amaya is incredibly wise, almost putting Solomon to shame. It was originally thought that this was his Quirk, but was proven wrong. He also has a vast knowledge on many subjects. Weaknesses: Amaya will not develop a Quirk, bringing shame and persecution to him. He also refuses to show emotion, and destroys people's image of him. Hobbies: Training and researching, saying that he has to work harder than anyone else if he wants to succeed. Pet Peeves: When someone is discriminatory to anyone (except for himself). Being noticed. What they are looking for in a boy/girlfriend: He doesn't really have a preference. As long as he can bring himself to love them, he will be content. What they are not looking for in a boy/girlfriend: Look at the previous section. If your character were stranded on an island and could only bring two things with them, what would they be? : Nothing. He would see it as a test--escape or survive the island with just the clothes on your back! If your character could change anything about themselves, what would they change? : Amaya would have an Individuality, so that he could be a Hero. Your character opens their fridge; what do they see? : Food of all sorts; his parents are fans of foreign food. The backstory was based off of Izuku Midoriyama's. I just edited it. Approved, just be careful some people might think you stole the whole story. So as long as there are many differences it should be fine.